You’ve seen “The Dress.” It’s the black and blue one your totally incorrect friend insists is actually white and gold. Or maybe you’re the one ready to defend to the death the whiteness of this garment. Since you’ve turned to science for the definitive answer to this hotly debated question, the good news is that neither of you need get your eyes checked. Viewing this from an app? Tap here for a better experience. The bad news is you may never be able to trust your brain again, according to neuroscience professor Bevil Conway. Conway, who teaches at Wellesley College in Massachusetts, chalks the phenomenon up to the way our visual system evolved. While we might think the question of colour has a right and wrong answer, it’s not so black and white in the real world. Sunlight changes colour throughout the day, making it necessary for our brains to interpret shades differently. For example, a banana might appear sort of orangey as it reflects early morning sunlight, but could adopt an almost blue tinge during bright midday light. For the sake of survival, the brain needs to know the banana is actually yellow and ripe no matter what colour the sunlight makes it appear. Our visual system is not just reporting wavelengths of light, but actively trying to figure out what that information means, Conway said. Conway said the dress has a perfect balance between orange and blue, which causes the brain to make a choice. If someone discounts the orange side of dress, they see it as blue and black. 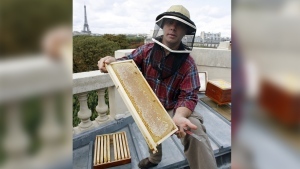 But if they ignore the blue side of it, Conway said, they see it as gold and white. You’ll see black and blue if you interpret the picture as a dark dress with bright orangey light shining on it. In this case, your brain ignores the orange to see the “true” blue colour of the dress. But if you think the dress is cast in a blue shadow, it will see the underlying blue as a false colour imposed on a truly white dress. The original image is in the centre, but the definitely-black-and-blue dress on the right is a lot closer to the actual, real-life colours of the dress. If you don’t believe that, check out a photo of the very same dress being worn at a wedding, taken by the original poster of the dress that broke the Internet. To drive home the point that our brains interpret light and shadow in strange ways, check out this checkerboard. The tiles labeled “A” and “B” are the exact same colour (the tiles in the right-hand picture haven’t been altered at all). And here are some interactive examples that let you play with the shadows to prove two very different looking colours can actually be identical. For further proof that your brain can’t always be trusted, Conway points to something called the “Necker cube” – this two-dimensional representation of a three-dimensional cube. Another example of the brain just choosing one interpretation from ambiguous options is this spinning dancer animation. Some people see the woman rotating clockwise, while others will see her spinning the opposite direction. And much like the colours of the dress, it’s possible to “reverse” the direction of the dancer’s twirl in your mind (try looking at the shadow below and then back up at the dancer). 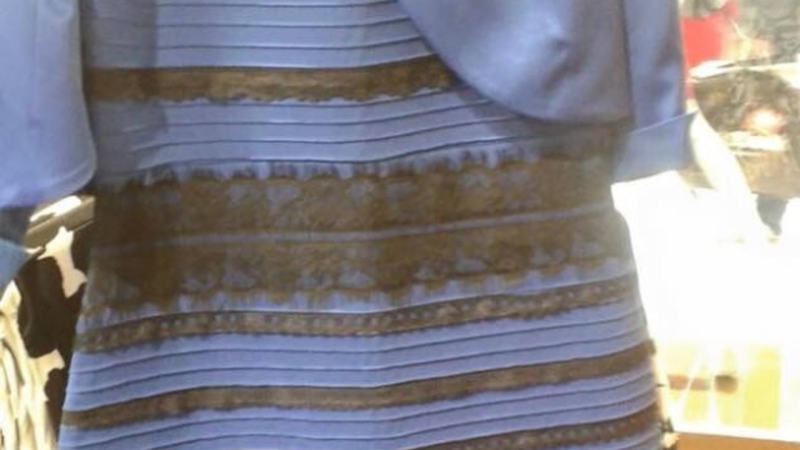 The dress dividing the Internet: Is it black and blue or white and gold?